The majority of the Seychelles islands were set up as the king’s spice gardens, the produce from which was sold in Port Louis, Isle de France (Mauritius). North Island was one of the richest suppliers to this industry. Cinnamon and vanilla are still widely grown in the Seychelles. Warm, sweet and spicy, they add the fragrance of the festive season to one of our North Island cocktails. Served ice cold, it’s a refreshing drink to finish off the day at West Beach Sunset Bar. Measure out the vodka, schnapps, cream and sugar syrup into a cocktail shaker. Split the vanilla pod lengthways and scrape out the seeds with the back of a knife. 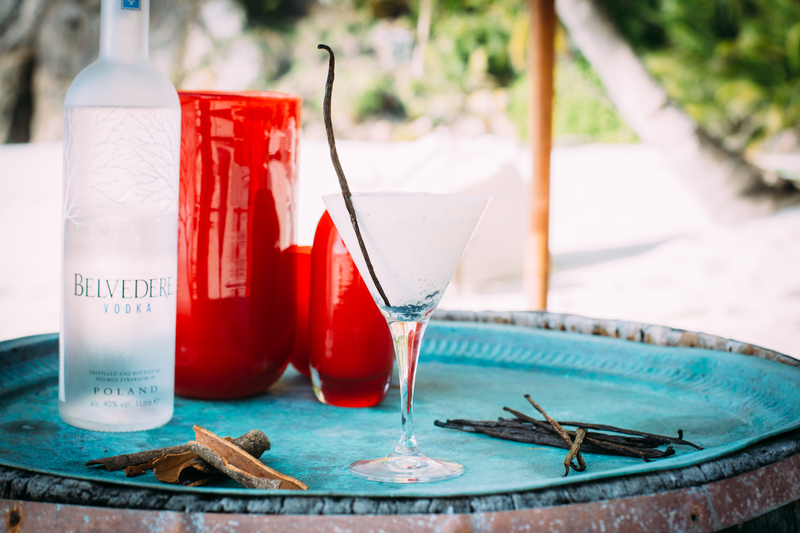 Add the vanilla seeds and whole cinnamon stick to the shaker, plus lots of ice and shake vigorously until ice cold. Strain into a martini glass, float a delicate layer of fresh cream on top and garnish with the vanilla pod and a sprinkling of ground cinnamon.